Trump is on a quest to refashion the United States into an authoritarian capitalist dystopian wasteland. There is no missing the messages Donald Trump has been sending even before white nationalist senior adviser Stephen Miller was given control over the administration’s immigration policy: Go away, migrants and asylum seekers, the country is full. That this is nonsense — Nordics need not apply? I don’t think so — is inconsequential to him and the people who carry his dank water. Cruelty is the coin of the realm, racism the language spoken to his devout base, and the rule of law broken and forged again in the fires of white nationalism is the final goal. The latest iteration of this ongoing degeneration arrived last Thursday, when The Washington Post reported that Trump had proposed shipping thousands of migrants to various “sanctuary cities” around the country as a way to punish Democrats who refused to give him his southern border wall. The idea, to the shock of none, was credited to Miller. Trump may yet do it if he can. A redacted version of the Mueller report is expected to be released on Thursday, and not everyone in Trump’s circle is as confident as he is in the exonerating powers of the document. Creating a crisis in order to capitalize on it has been Trump’s style going back to his bankrupted business days, and he may fling thousands of people into the night simply to change the subject. It won’t last, because it never does, but he will win the headline wars for that day, and that is as far as he ever thinks. There is a piece of traveling public art that stood for a time outside the headquarters for the Saint John’s Hospice on Race Street in Philadelphia. It depicts Jesus Christ as a homeless person wrapped in a blanket sleeping on a park bench. The only visible physical features of the figure are the feet, each with nail holes visible. The holes are not properly placed anatomically, but the overall effect remains striking. So striking, in fact, that police were called after the art was placed in a wealthy North Carolina community when someone thought it was an actual homeless person, because irony. This president has been busy in his quest to refashion the United States into some authoritarian capitalist dystopian wasteland. I would like to take every self-labeled Christian Trump supporter who cheers the idea of dumping exhausted, frightened men, women and children who are far from home into the middle of unsuspecting and unprepared cities as “punishment” for Democrats, and march them past that bench. If such a thing as miracles actually exist, the statue might sit up and ask them why. The Bible has quite a bit to say about welcoming immigrants, none of which involves harming them in order to harm opponents. 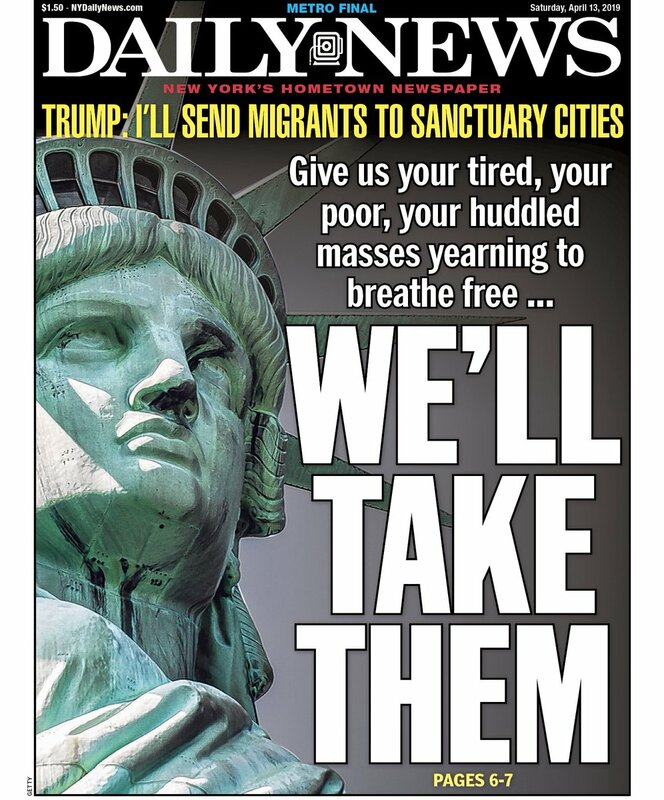 Meanwhile, residents of those sanctuary cities are prepared to mobilize to welcome and support immigrants, in the event Trump follows through on his threat. So it goes. This president has been busy in his quest to refashion the United States into some authoritarian capitalist dystopian wasteland. His nomination last month to the Federal Reserve Board of Stephen Moore, co-founder of the far-right Club for Growth, is further proof of his motives. “Capitalism is a lot more important than democracy,” Moore said in 2009. “I’m not even a big believer in democracy.” Neither is Trump. Donald Trump wants to make America his, now and forever. That is what passes for a bold statement from a Republican in the age of Trump, simply because it’s half-accurate. Trump does want to scramble the conversation, and he does want everyone talking about him on the television, but that is no longer the point of the exercise. He has come to enjoy the trappings of power and the protective legal firewalls that insulate him from consequences. To date, no member of Congress in his party appears even remotely interested in attempting to slow him down, even as he seeks to strip the power of the legislative branch bare. Trump’s 2020 campaign has amassed a staggering $30 million war chest in the first fundraising quarter alone, but he appears to be unwilling to wait for the validation of re-election and rightly fears all the agencies awaiting his last day in office with subpoenas in hand. His behavior — using human beings as game pieces, ordering officials to break the law, nominating or appointing anti-democracy activists to powerful positions — gives shouted lie to his campaign slogan, “Make America Great Again.” Donald Trump wants to make America his, now and forever. Greatness, or even goodness, has nothing to do with it. Stephen Miller’s brazen fascism now dominates White House policy.